Bicycle and transit riders are often the same people on different trips. Riders switch modes depending on the length, destination, and purpose of their trip, who they are traveling with, and where else they might go. Bike and transit systems can be planned as complementary modes that add more value together than apart. Bicycle networks extend the reach of transit, providing an easy way for many transit riders to make first- and last-mile connections. Integrating bike share and personally owned bicycles with transit is a key step in creating an urban mobility system that covers the entire city or urban area. Not all transit streets will attract high bicycle volumes or provide a high-comfort bike facility. In some cases, such as high-volume transit streets without a general traffic lane, it may be impossible to safely accommodate bicycles even for local access. In these cases, high-comfort bicycle routes should be provided on nearby parallel streets, generally no more than 300–400 feet away, with special attention paid to bike parking and wayfinding. Providing for safe bicycle operations at low speeds is an acceptable design strategy on streets where it is not physically possible to provide dedicated, high-comfort bike facilities. Where bikeways run parallel to a transit street without dedicated bike facilities, provide wayfinding to major destinations that minimizes bike travel on the transit street. Provide on-street bike parking at intersections of the transit street to conveniently accommodate bicyclists accessing destinations on the transit street. Nearby or parallel high-quality transit and bicycle facilities are mutually supportive, enhancing one another’s effectiveness. Where it is not possible to install high-comfort bikeways on a transit street, provide a high-comfort bicycle route on a nearby parallel street. Bikeways should be provided on transit streets in a manner consistent with local bicycle planning priorities and policies. On one-way streets and large two-way streets, numerous opportunities exist to provide a high level of comfort to both modes (see Transit Streets). On streets with bus and general traffic lanes but no dedicated bikeway, consider using bus-bike lanes. These design strategies acknowledge that bicycle travel demand is present on every street, and that bus facilities are particularly attractive to bicyclists. Bicycle wayfinding signage should be used to guide bicyclists to transit stops, especially for rapid services and other transit lines with significance for long trips. 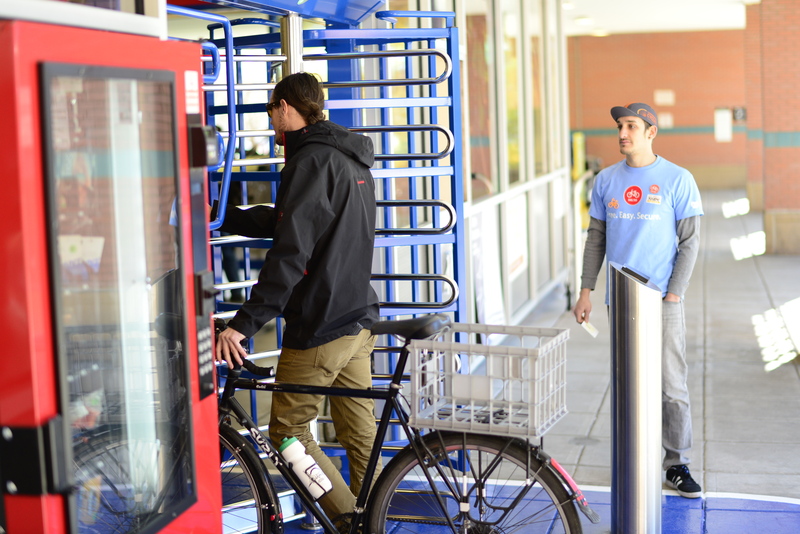 Secure bike parking and bike share provide a large number of passengers with bike-to-transit access, and allow the use of bikes at both ends of a transit trip without carrying the bike on transit. Bicycle parking should be provided near transit stops and stations. 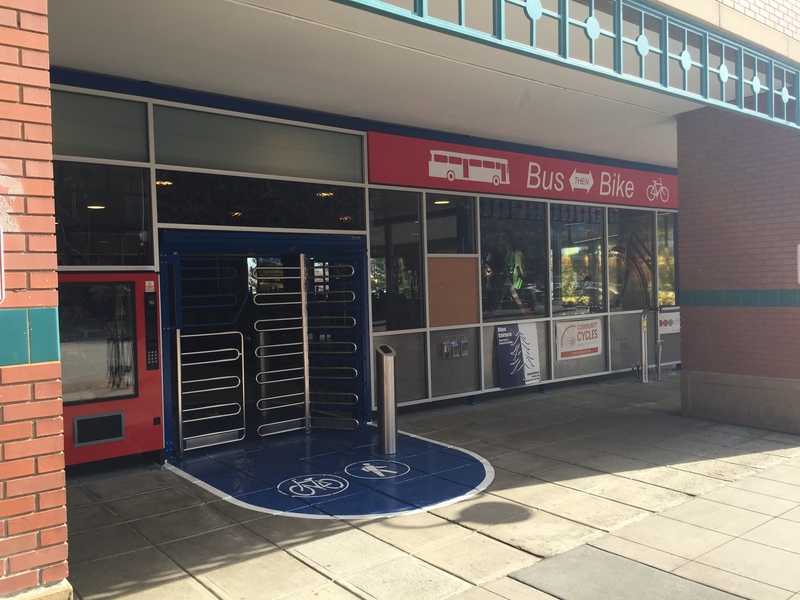 Bike share stations can be co-located with transit stops to form mobility hubs. Unless directly adjacent to a transit stop or platform exit, the location of a bike share station should be noted on wayfinding signage at the stop or station. Transit vehicles can carry bicycles inside or outside the vehicle. 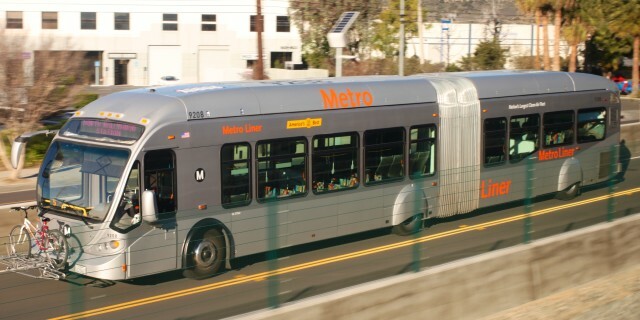 Articulated low-floor buses, streetcars, and light rail vehicles can all accommodate interior bicycle access, ideally through a center door with large interior clear areas. Racks can be designed to hold bikes in either an upright or a hanging position; not all passengers and not all bikes can use racks that require lifting. Peak-period transit ridership can complicate interior bicycle access due to space constraints. Front-end exterior racks with capacity for two to three bicycles, or upright or hanging rear racks, are a common bus feature. Exterior rack loading time adds to stop dwell time, sometimes significantly. Loading a bicycle onto an exterior rack takes 20–30 seconds. Accessing an exterior bike rack may present challenges for passengers, depending on curb height. For near-level or level boarding, platforms should be 5 feet longer to permit front-end bike racks. Where exterior bike racks are used with high platforms, identify how passengers can step to or from street level with a bicycle. 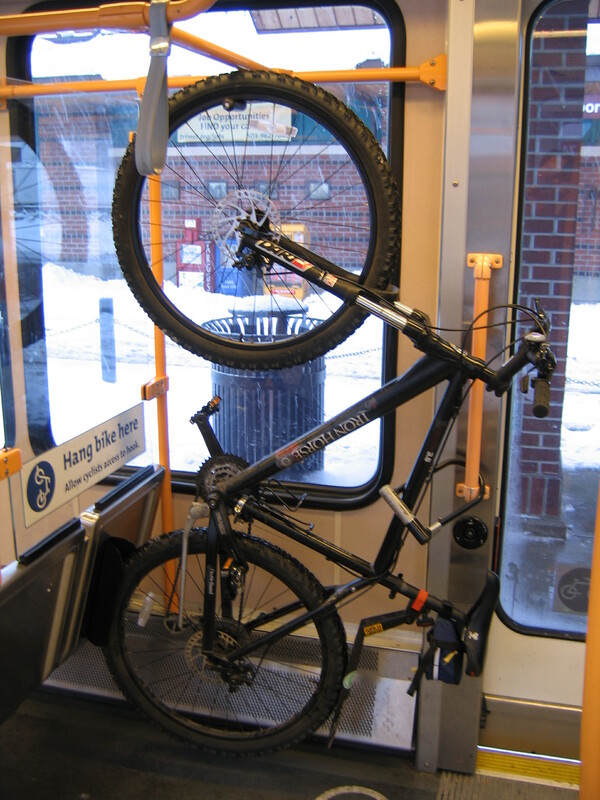 Where bike volumes are high, it is difficult to accommodate them on transit vehicles. In these cases, bike parking at origin stations and bike share at destination stations is the best alternative. References for Bicycle Access & Networks: 1 found.